For my third participation to the Foodista challenge, a food challenge organised by Stéphanie from Cuisine moi un mouton, I am sharing with you a charlotte. But not any kind of charlotte. 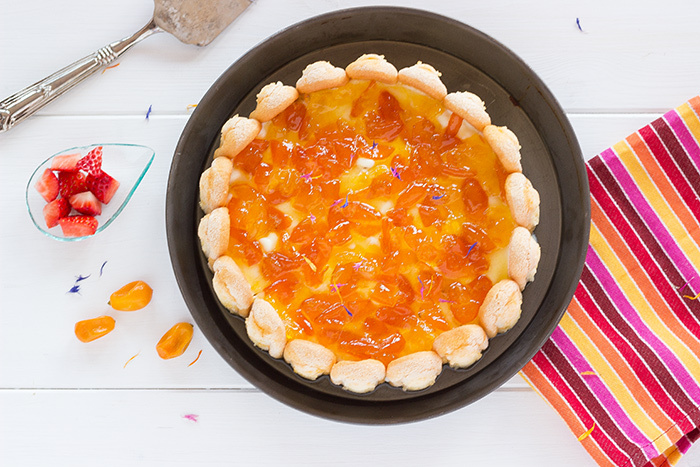 A charlotte with strawberry, kumquat and mascarpone. If you want to know more about the foodista challenge, please check the French version of this post. I love mascarpone and strawberry is my favorite fruit as you can see checking my strawberry tart and my strawberry salad. Bring some water to a boil in a little saucepan. Put kumquat for 5 minutes. Remove and slice in small pieces removing the seeds. Place in your refrigerator at least 3 hours or overnight. Cook for 40 minutes and reserve. Wash and cut strawberries. Reserve. Cut sponge biscuits so they have the same size of your pastry circle. Put your circle on a baking tray. Place biscuits all around and finish by filling the bottom of the circle with the rest of sponge biscuits. Mix cottage cheese with sugar and mascarpone. Pour half of this mix in the circle. Add strawberries and cover with cottage cheese mix. 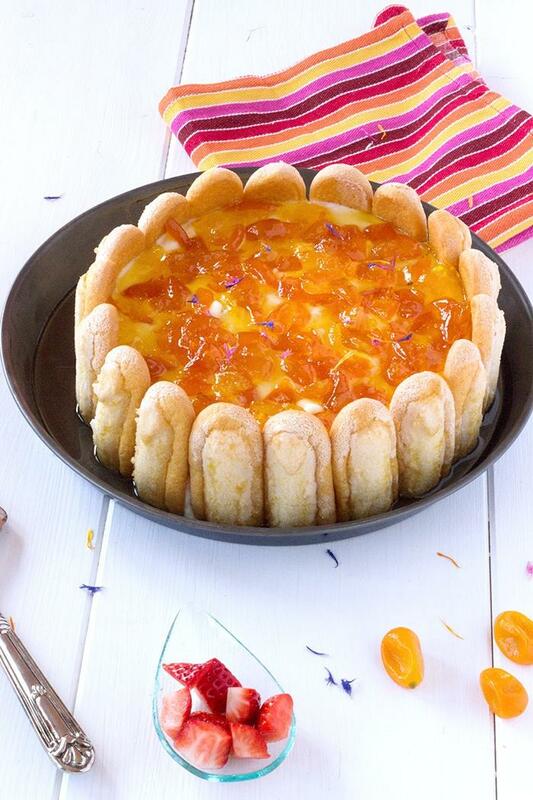 Finish your charlotte pouring kumquat coulis on top. Refrigerate two hours before serving. This charlotte is really delicious, however she makes some juice. So serve quickly. This is absolutely gorgeous! You’re very talented! Thank you very much Chef Mimi. I’m blushing 🙂 !